Are you considering getting a rabbit or two? Rabbits can be fun and affectionate pets. I like to think of them as a funny mash up between cats and dogs. They are friendly and trainable like dogs, but also sometimes aloof and will give you attitude like a cat. 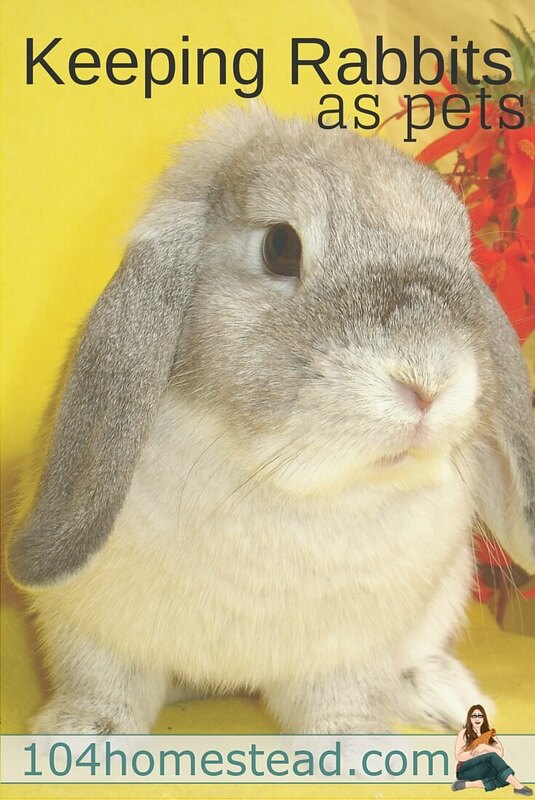 In the end though, they act like rabbits and can be very sweet, affectionate, entertaining, and fun. If you want a really sweet pet rabbit, don’t keep it outside in a hutch. It will not bond to you, it will not like being carried in and out, and it will not be safe for it to hop around in your backyard unless you do some serious bunny proofing. If you want your rabbit to be able to hop around outdoors you will need to bury some ¼ inch hardware cloth under the pen, and have it extend up into your fence line because rabbits will dig, and they will leave your yard. You will also need to cover the top to prevent predators such as cats, dogs, and hawks from having a snack. Plus you don’t want to leave your pet outside all alone, because he or she will be sad. The best place for a pet rabbit is indoors. Rabbits can be very territorial and want to have their own den. You can use a cage for this, but they aren’t the best choice. Wire cages are rough on rabbit feet and most aren’t big enough. If you do keep your rabbit in a cage it needs to be tall enough that they can stand up on their hind legs and not have their ears touch the top. It should have two levels to provide an opportunity to jump up and down. The minimum size for one rabbit should be six square feet, but a better rule of thumb would be five times the size of the rabbit. If you have an eight pound bunny, they should have access to at least 40 square feet of space. I’m a big fan of using Neat Idea Cubes for modular rabbit housing. Using zip ties you can put them together in lots of shapes and sizes to fit your home and your housing needs. This gives your rabbit a bigger area that is safer than what you can provide with just a cage. Bunny proofing is an absolute necessity for pet rabbits. Even if you provide toys they will chew and that will damage them or your house. 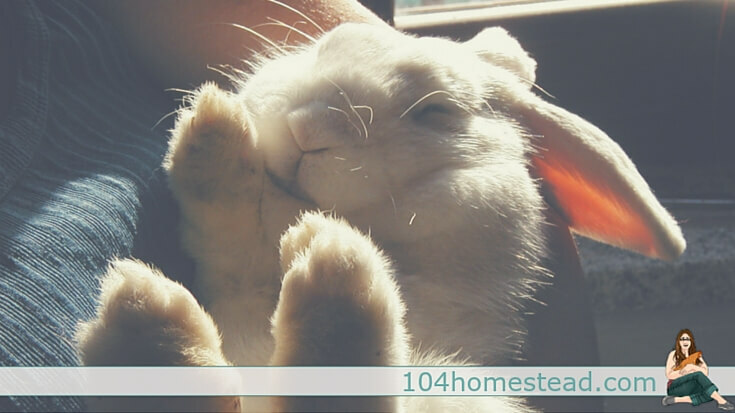 Books, electrical cords, papers, and houseplants should be moved out of the rabbit’s reach or placed behind furniture where your rabbit will not be able to fit. You can hide some cords in clear plastic tubing from the hardware store by cutting a slit in one side and then sliding the cord inside. You still need to supervise though, because with enough time your rabbit can still chew through it. Cardboard boxes placed under furniture can discourage your rabbit from crawling underneath couches or beds and taking up residence in their new “den”. Even if your house is rabbit-proofed you will still need to supervise when it is out and about. As for chewing on molding and furniture, the best deterrent is supervision and a spray bottle of water in addition to blocking walls, edging, and door jams with pieces of wood or hard plastic sheeting. Rabbits can be very affectionate and will love to snuggle with you, especially if you come with their favorite snack. Rabbits groom each other and you should definitely groom yours. He or she will need brushing and nails trimming, and will probably start licking you to groom you in return. If you aren’t going to have a lot of time to spend playing or petting your rabbit you may want to consider getting two. Make sure to provide lots of space and a couple of feeding areas because rabbits are territorial and one of them will be the head honcho and push the other one around. You want to make sure they both get a chance to eat their fill. If you have two, you should definitely get them spayed or neutered, or you risk suddenly multiplying your rabbit numbers! Two unneutered males will fight, and females will also get along better together when spayed. Feeding a pet rabbit is pretty straightforward. They will need a ready supply of grass hay and pellets, plus a salt and mineral spool. The tricky part of keeping pet rabbits is not overdoing it on the treats. Rabbits have a very delicate digestive system and large changes of any sort can cause problems. Even something as seemingly safe as feeding a large amount of watermelon can lead to ketosis and death. Some safe treats include a tablespoon or two of fruit each day, and a cup or two of leafy greens. Any time you are introducing a new food or changing quantities, go slowly to give your rabbit’s digestive system time to adjust. Pet rabbits will also need some entertainment. They like to chew and will need safe wood to chew on. They like to rip and shred, so a cardboard box can be great fun. Bird toys such as balls with bells inside, or even sturdy ropes for small dogs, are all fun for a rabbit to fling around. Rabbits like to set up their area just so and can get very grouchy and possessive if you mess up their hard work by constantly putting all their toys away. This is another reason to give your rabbit their own space in addition to letting them hang out around the house. Rabbits can be litter box trained! They tend to pick one or two areas where they like to do their business, so placing a cat litter box full of hay, straw, or paper bedding in that area will keep down the mess. Rabbits also poop while they eat, so placing a box under their hay rack will also encourage them to use the litter box. They mark their territory with their pellets, so you may still find a few here and there, but the wet messes will be contained. 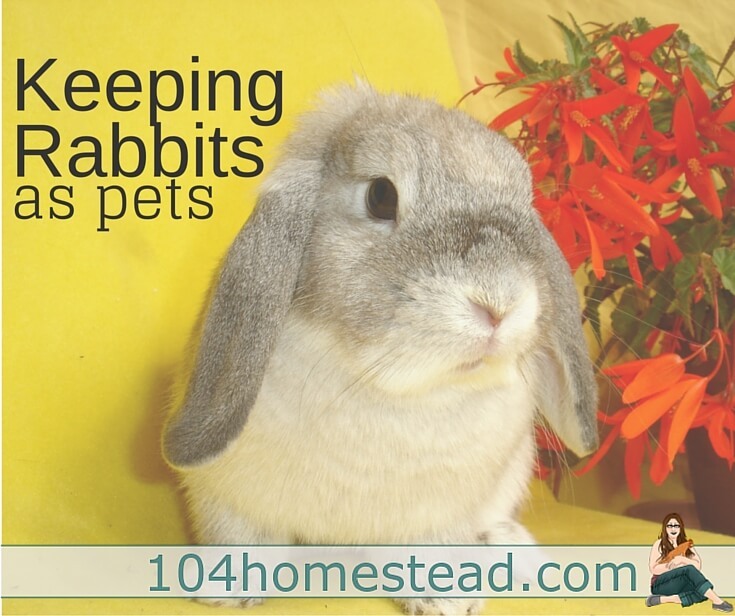 Rabbits can be rewarding pets if you set up their home environment well and give them enough space and things to do. If your rabbit is happy, then you’ll know it because they will binky, which is like a happy dance where they jump up and twist their head and body in different directions. Happy pets are the best! Kathryn Robles has an urban farm on her 1/10th of an acre in Portland, Oregon. Their homestead includes 4 human kids, two Nigerian Dwarf does, American Chinchilla rabbits, chickens, a goofy black lab, and two cats. She tries very hard to overcome her black thumb, and writes about her urban homesteading adventures at Farming My Backyard. Awe! The cuddles in the first picture! sooo cute, I want to snuggle!! !